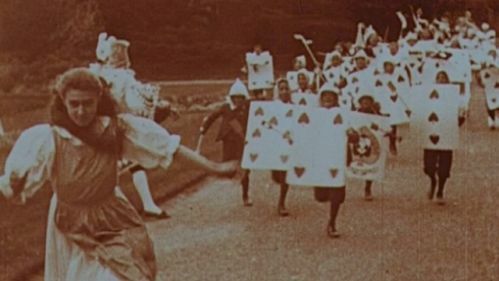 Once lost, this eight minute, very damaged, but very delightful silent version of Alice in Wonderland was restored several years ago by the British Film Institute. It is the first film adaptation of the 1865 Lewis Carroll classic. And at the time, the original length of 12 minutes (eight are all that’s left) made it the longest film coming out of the nascent British film industry. After about a minute, the eye ignores the damage of the film, like the ear ignores a scratched 78 rpm record. Viewers can expect several vignettes from the novel, not a flowing narrative. It starts with Alice following the White Rabbit down the hole, the “eat me” and “drink me” sequence, the squealing baby that turns into a piglet, the Cheshire Cat, the Mad Tea Party, and the Red Queen and her playing card minions. The coloring of the negative is a BFI reconstruction of the original colors, by the way. The film was produced and directed by Cecil Hepworth and Percy Stow out of their Hepworth Studios in Walton-on-the-Thames, near London. They show knowledge of the camera trickery pioneered only a few years earlier by Georges Méliès, like the shrinking and growing Alice and the appearance of the Cheshire Cat. That cat, by the way, was the Hepworth’s family pet. Hepworth himself plays the frog-headed footman, and his wife played the Red Queen. May Clark, who played Alice, was 18 at the time, and had already worked on several Hepworth productions, and not just acting. According to her bio at the Women Film Pioneers project, she did a bit of everything around the studio, “from special effects and set decoration to costume design and carpentry.” The early days of film have a real “student project” feel about them, no pigeonholed roles, just everybody chipping in. As for Cecil Hepworth, he appeared destined for a career in film, as his father ran magic lantern shows. Cecil worked for several companies before setting up his own and wrote one of the first books on the subject, Animated Photography: The ABC of the Cinematograph. His company continued to make films in this early style through 1926, but eventually ran out of money. To pay off debts, the receivership company melted down his films to get the silver, which was the reason most scholars thought his films were lost. In 2008, one of his films was discovered, and then “Alice.” There may still be others out there. You can find Alice’s Adventures in Wonderland in our collection, 800 Free eBooks for iPad, Kindle & Other Devices. And the 1903 film listed in our other collection, 1,150 Free Movies Online: Great Classics, Indies, Noir, Westerns, etc.. Ted Mills is a freelance writer on the arts who currently hosts the FunkZone Podcast. You can also follow him on Twitter at @tedmills, read his other arts writing at tedmills.com and/or watch his films here. Humpty Dumpty (in a rather scornful tone): When I use a word, it means just what I choose it to mean – neither more or less. Alice: The question is, whether you can make a word mean so many different things? Humpty Dumpty: The question is, which is to be master – that’s all. Humpty Dumpty: They’ve a temper, some of them – particularly verbs, they’re the proudest – adjectives you can do anything with, but not verbs – however, I can manage the whole of them! Impenetrability! That’s what I say! Alice: Would you tell me, please what that means? Humpty Dumpty (looking very much pleased): Now you talk like a reasonable child. I meant by impenetrability that we have had enough of that subject, and it would be just as well if you’d mention what you mean to do next, as I suppose you don’t mean to stop here all the rest of your life. Alice (in a thoughtful tone): That’s a great deal to make one word mean. Humpty Dumpty: When I make a word do a lot of work like that, I always pay it extra. Alice (too much puzzled to make any other remark): Oh!